Rapid transit map items include metros and light metros, rapid trams, rapid buses, urban cable cars and monorails, urban funiculars, and other systems that transport passengers and do not run along city streets. Rapid transit items includes sections of rapid transit lines, lines in their entirety, stations, and exits from stations. These include light-rail transport systems (rapid trams and transport systems of the “light metro” type that are structurally similar to rapid trams). These will be referred to further on as LRT systems. Special drawing rules and attributes apply to LRT systems (see below). 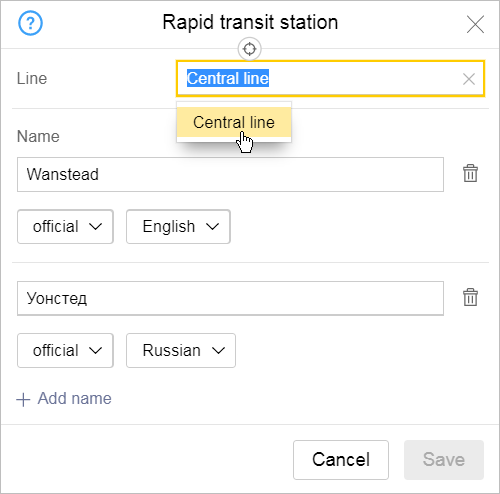 When you add attributes to sections of a rapid transport line, follow the rules that apply specifically to their attributes. 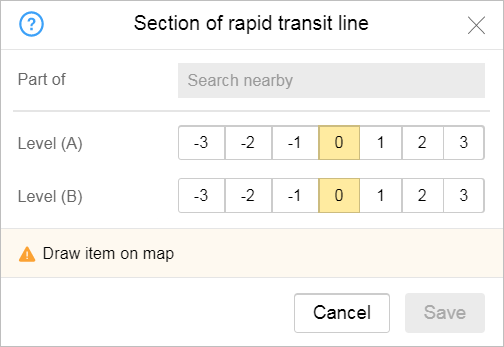 The “Part of” attribute indicates which specific rapid transit line a section belongs to. After you save the item, the name of the line displays in the panel as a link that opens the entire line editing panel. Editing techniques for these composite linear items are described in section 2.6.2. Composite linear items. Do not edit the Level A and Level B attributes for high-speed transport lines. 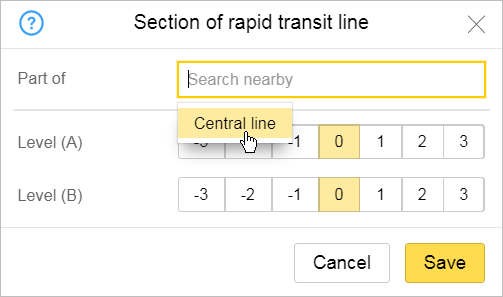 The “Rapid transit line” attribute indicates which specific rapid transit line a station belongs to. For stations in light-rail transport systems, enter the lines or transport systems that they belong to. Always enter the Caption name without including the map item type. official: Tyopliy Stan Metro, Biblioteka imeni Lenina Metro. for signing: Warm Mill, Lenin library. For unofficial names (such as historical ones), you can choose whether or not to include the item type in the name. For example, you can enter either Izmailovsky Park or Izmailovsky Park Metro. Например: Solnechnaya rapid tram station. Name “for caption on map” in format [proper name]. 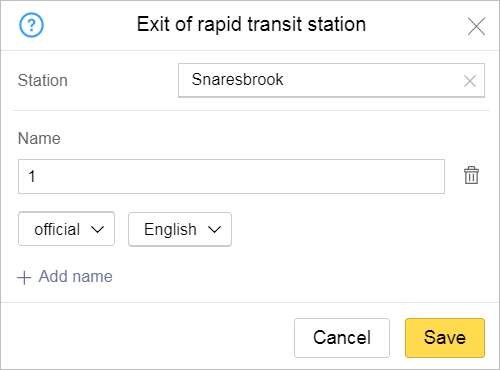 The “Rapid transit station” attribute indicates which specific rapid transit line station an exit belongs to. 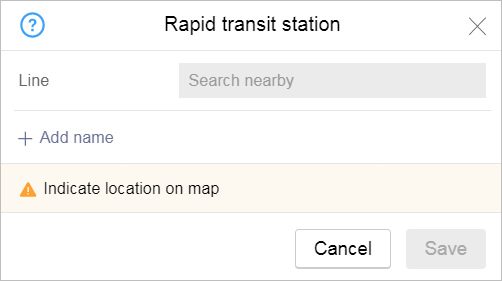 If the high-speed transport station is already drawn on the map, then when filling in the field it is recommended that you choose a name from the list. If there is no station on the map yet, you should first create it (see Section3.13.1.2. Rules of drawing high-speed transport stations), and then the corresponding exits for the stations. You must enter the parent station for all station exits in light-rail transport systems. High-speed transport station exits should only be captioned if they have a proper name, number or any other label already. Otherwise, do not caption them. Such proper names, numbers, and labels should belong to the “Official” name type. The “For caption on map” name type should only be used when an exit has an official name that needs to be shortened. Only this abbreviated name should be used as the caption. 1) Keep in mind that captioning nearby streets, address points, and landmarks does not substitute a proper name for an exit (ex: exit to Andropova Avenue, exit to Orbita cinema theater, exit to Kolomenskoye Museum-Reserve, etc. ).